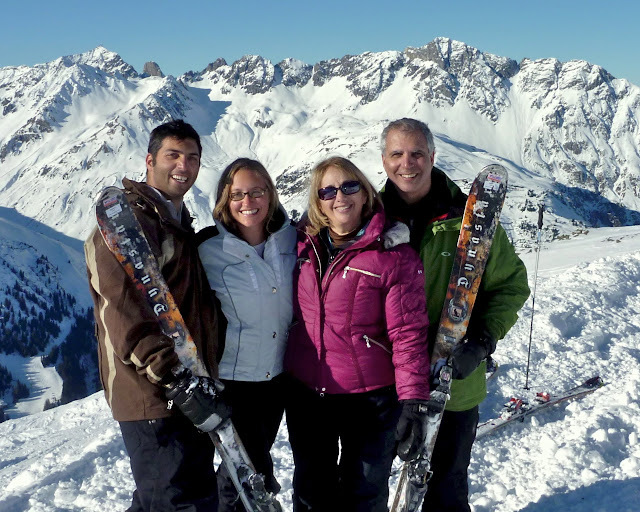 We were so excited for our trip to Austria for a variety of reasons… a great get away, a chance to ski in Europe, and last but not least, a week with Jesse and Dave. We had not seen them in a couple of months and I could hardly contain myself until they arrived (especially since they were coming from Cairo, where significant protesting had just begun on the day of their departure). Our reunion in Munich was wonderful, a harbinger of the week to come. We began our trip with a more serious than fun activity…a day trip to Dachau - somber and moving but well worth it. The Comité International de Dachau maintains the site and runs a superb tour through the camp, including a challenging exhibit "Path of the Prisoners" that documents the chronology of the Dachau Concentration Camp through the stories, photographs and personal effects of the prisoners. The weather was gray, dreary and freezing which seemed more than appropriate for this activity. The entrance gate at Dachau reads "Arbeit macht frei" meaning "through work one will be free"
The cold and overcast day was fitting. The rest of the our Dachau photos can be found here. 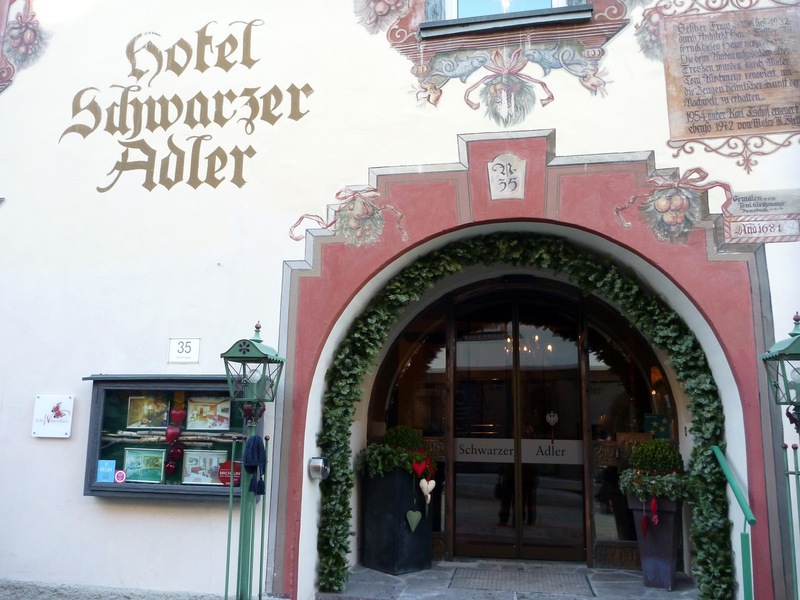 Our destination for the week was St Anton, Austria, (a 2 ½ hour drive from Munich) where we spent the week at the Schwarzer Adler Hotel. It was fabulous on every level. It has been an inn in St Anton since 1573 and they certainly know about hospitality. Our package included our room, ski passes and breakfast and dinner daily. What a treat – the breakfast buffet was extensive and delicious with fresh and dried fruit, meats and cheeses, fresh baked breads, cereals, fresh juices and if that was not enough you could order anything you wanted. The pancakes were notably delicious. And, Dave would make a few sandwiches from the breakfast buffet for his pre-lunch “snack” every day [DSM: I still dream of the prosciutto & swiss on a freshly baked pretzel roll. Mmmmmm]. 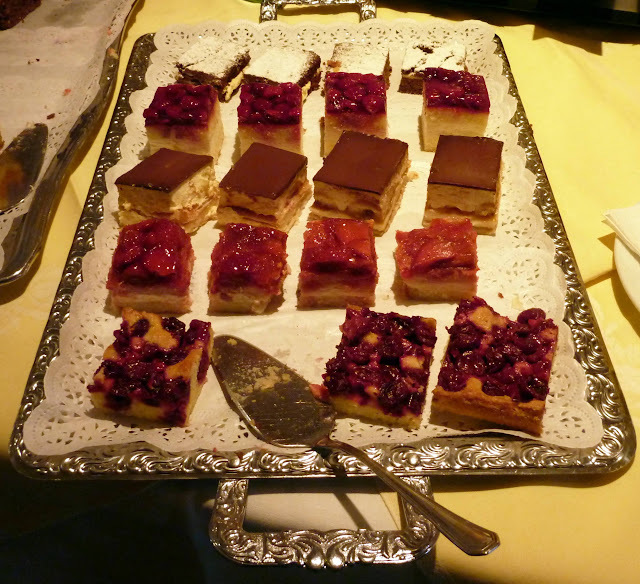 Their après ski menu was equally delicious with fresh baked pastries and meats and cheeses, tea, coffee and cocoa. The jewel in the crown of the daily meals was dinner, a five course extravaganza (except the night of the “gala” dinner which was six courses). Every night was as scrumptous as the one before and we enjoyed every minute of it. 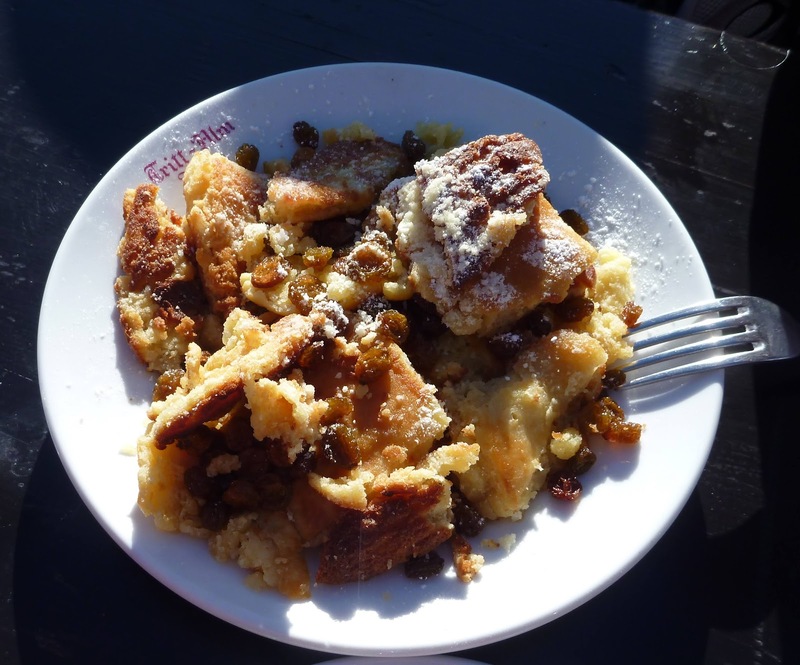 The desserts were great, but to our surprise apple strudel was never on the menu! 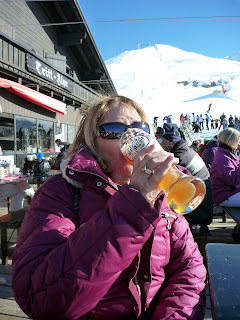 The skiing was also wonderful. 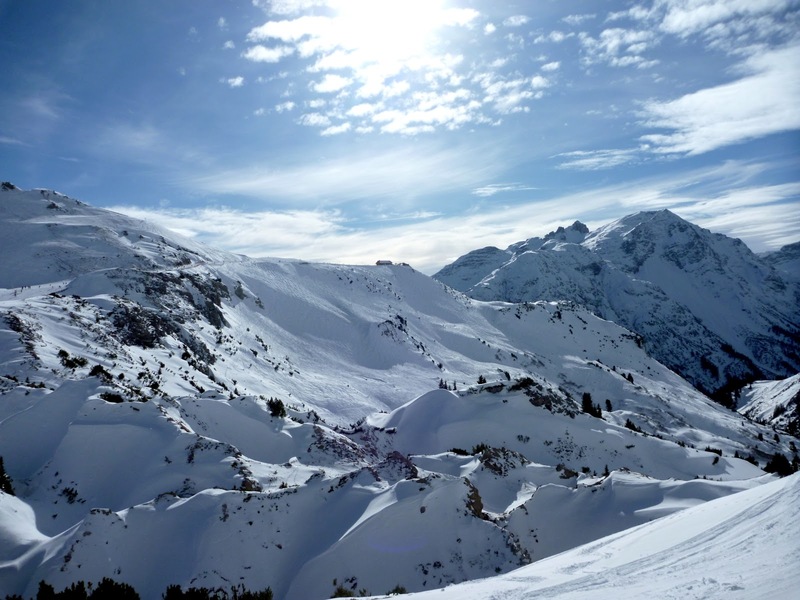 We had always been told that the conditions in Europe were not as good as the Rockies and that certainly was true this week. 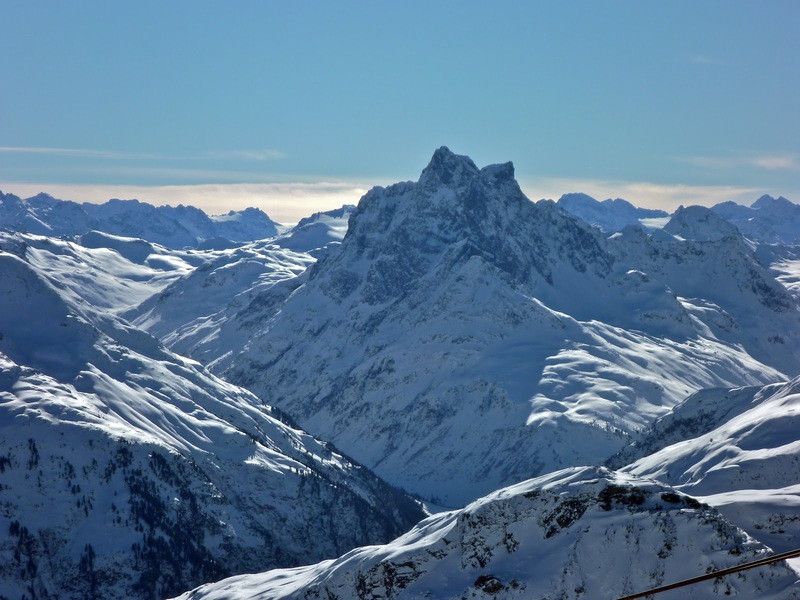 St. Anton had not had any new snow for over a week. The conditions were hard pack with lots of man-made snow, but we arrived to beautiful sunshine that stayed with us for the entire week. Hooray! Jesse and I were thrilled. The boys would have enjoyed some new snow (too bad). Dave and Steve did go off-piste one day with a guide and skied and hiked their butts off for some old but still sweet powder. 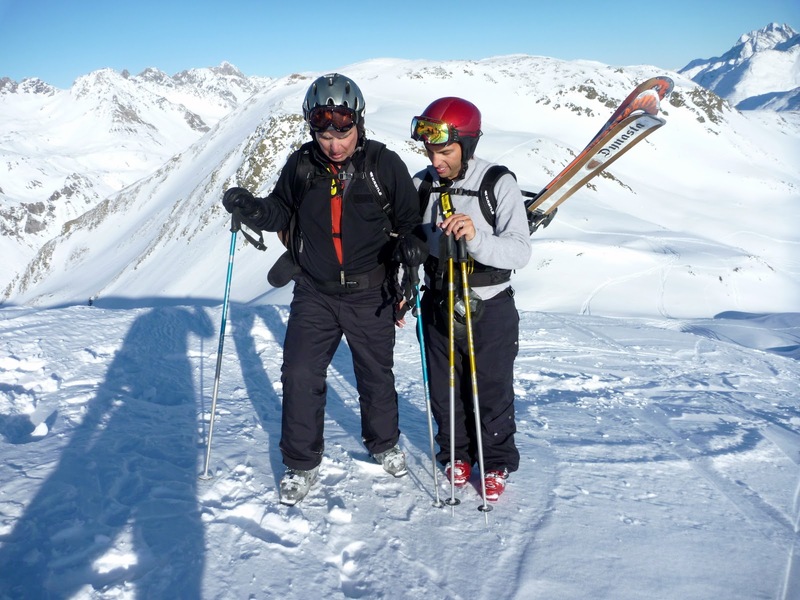 The guide and Dave carried Steve’s skis in deference to his age! Dave carries three skies and no money. Steve carries zero skies and a fat wallet. After the hike Steve could only manage a half-smile. This must have been before he saw the untouched powder field reward we earned. 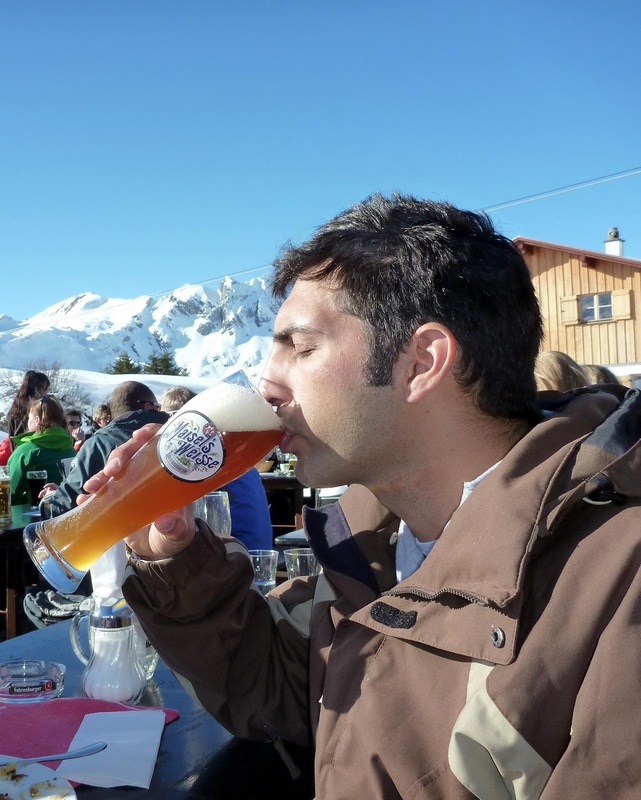 This particular ski area includes 5 villages that are interconnected either by ski trails or you ski to a bus stop and take a 15 minute ride to the next village and continue skiing there. Our biggest adventure was on our first day when we didn’t really understand the trail signage too well. Red is intermediate (unlike in the US where blue is intermediate)– we did not know that there was a BIG difference between red circles (on-piste – groomed and nice) and red triangles (off-piste – not groomed, cruddy and steep). 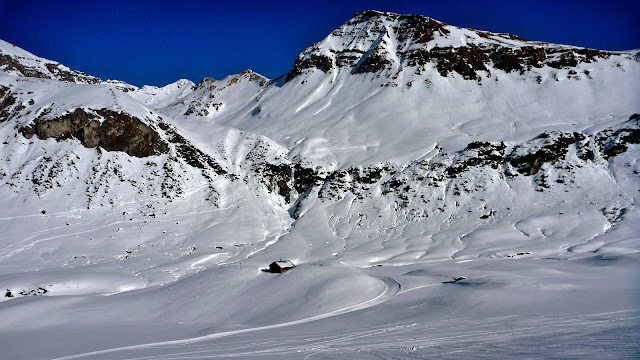 It was Jesse’s and my goal to not ski off-piste at all but alas, the best laid plans sometimes do not come to pass. 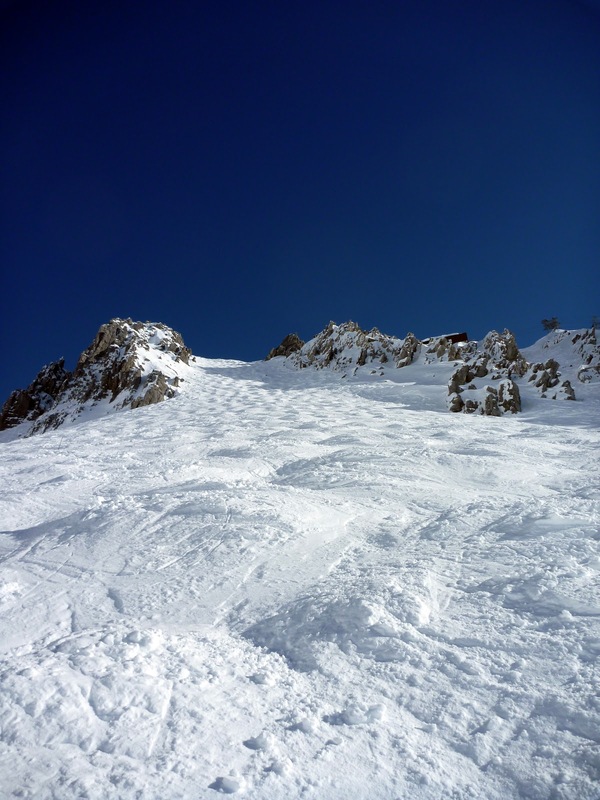 Our second run of the day led us to an off-piste trail that was very steep. I am proud to say that both Jesse and I picked our way down with much patient coaxing and encouragement from our respective spouses. It took us about an hour and I am proud to say the neither Jesse nor I cried but we both came pretty close! Lots of icy bumps and crusty crud! Once off that horrible trail we were rewarded with a yummy on mountain lunch, which we ate outside in the beautiful sunshine and scenery. Lots of beer was included. 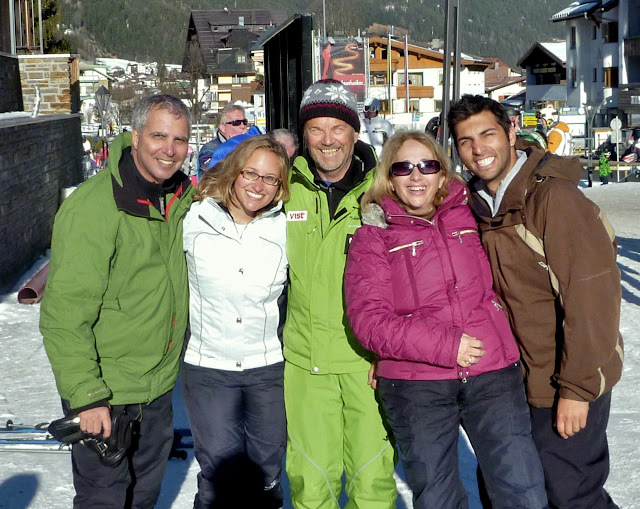 The next day we hired an all day guide who took us all around the mountain on piste. 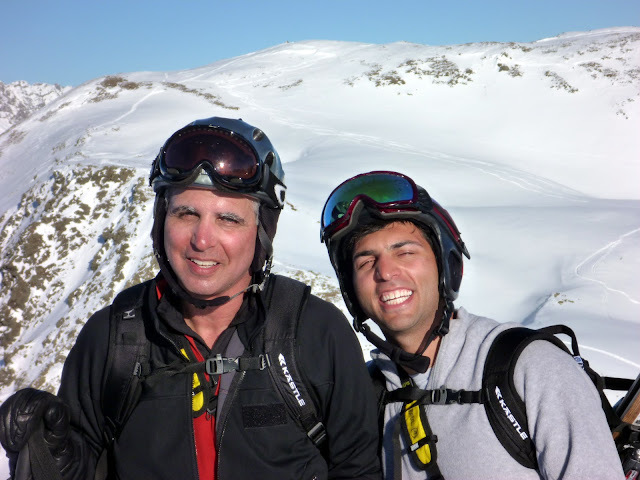 He was a life long native, former Austrian Olympian, and we had a terrific day with him, as he led us down the trails always finding the best snow. The guide is the old dude in green! Oh wait, that is not specific enough. The old dude in all green. In addition to the wonderful ambience of the entire area the scenery from the villages and the views from the top (yes, we went to the very tippy top) of the mountains was spectacular. We ended our trip with an afternoon in Munich seeing Marienplatz (the main town square) and eating at the famous Hofbrauhaus, which is known for its huge beers & pretzels, and mediocre food. It did not disappoint on either count. All in all, a great and memorable week and we were glad to be included in part of the grand tour! 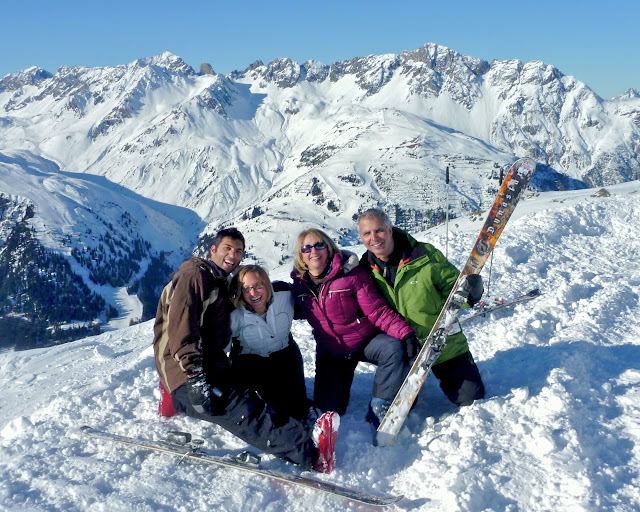 More St. Anton photos can be found here. Munich photos are here.